Just this week, after a particularly miserable Wednesday in more ways than one, a magnificent Thursday followed all at once. Bright blue skies were matched by a soft breeze and Aberdeen’s granite cast pools of cold shadows on the pavement. I was dashing around this wonderful city in the morning, my little phone serving as my dictaphone as I chatted and laughed with some wonderful people with intriguing stories to tell. I sipped a beautiful Lavender Citrus iced tea, squinted my eyes in the sunshine as I sucked on a Caramel Frappuccino (first of the year!) and talked and talked. It’s funny to think in this little old job of mine, talking is at the very centre of what I do. So when this glorious day disappeared as the wind whipped against the side of the flat, creating cows’ licks at the sides of my ponytail, it felt like that beautiful spring day had gone. Plans crumbled and the rest of the weekend was looking boring and miserable. Until I bought a flan tin. As much as I pray for beautiful sunshine to stream through the windows as I crumble butter into clouds of flour, sometimes a dark moody sky reminds me that photography in this weather is a challenge. I have been playing around with Luke’s camera for a good few months now and I am finding the experience exhilarating and terrifying all at once. My white balance may be blue-tinged at times and the colour saturation way off, but the challenges of lighting and ambience make for a better blog I feel. So after a week of sun-saturated chatter, I’ve found myself in the dead silence of a Saturday morning. The rain lashes against the windows and the sky is that particular hue of grey that screams ‘stay indoors and curl up with blankets’. Instead I savoured the quiet silence and reflected on my past week, soaking in my appreciation for my life and all the challenges it brings. And so my quiet weekend led me back to one of my favourite pastimes, pastry making. It can often seem a scary thing – I am constantly running my hands under cold water to keep a short crust and mindful of adding too much liquid to the mix. But the act of pastry making requires concentration and quiet, and all at once I am quite grateful for the grey weather giving me that space. 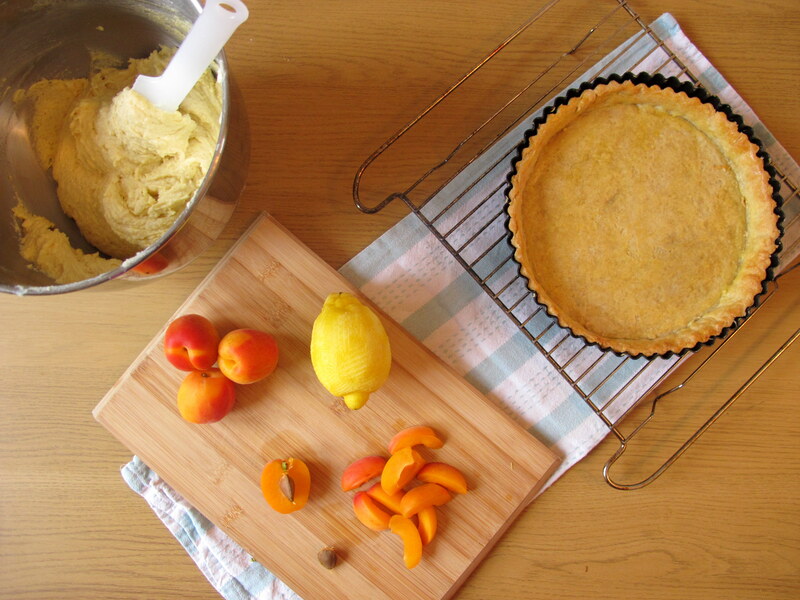 I filled my favourite pastry recipe with a delicate frangipane and studded it with sliced apricots. A flake of almonds and a flash in the oven yields a beautiful spring-like tart that is perfect for cosying into those piles of blankets and enjoying the fat rain splashing against the windows. Summer is just round the corner anyway. Note: This frangipane recipe makes enough for two tarts, so use one half for this recipe and either refrigerate the other half for up to three days in an airtight container or freeze. Bring back to room temperature before using again. Preheat an oven to 200oc/180oc fan/Gas Mark 6. 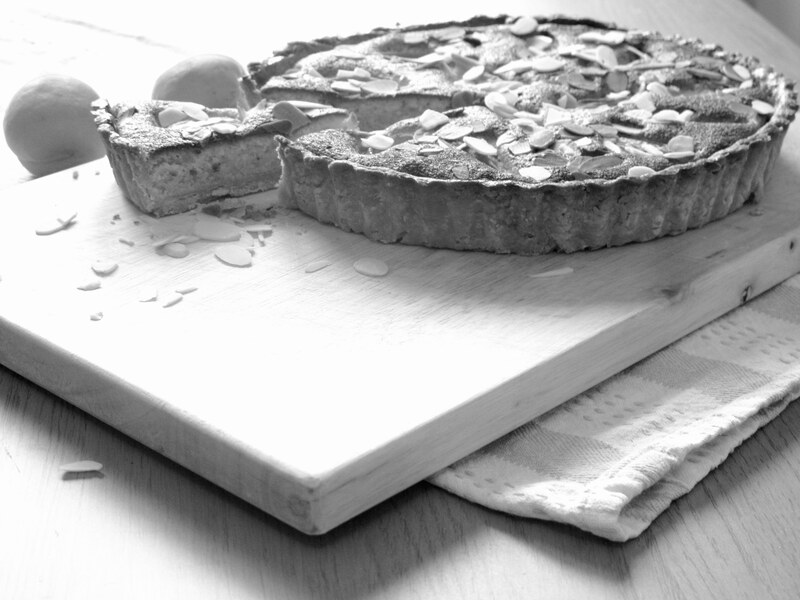 Cut the top off the pastry by rolling the pin over the top or by pressing with your thumb to form a neat edge. Place a sheet of baking parchment over the pastry and fill with baking beans or lentils. Bake for 15-20 minutes until the pastry feels dry. Remove the paper and beans and bake for a further minute to dry out. Brush the pastry with the remaining egg to seal and return to the oven for a final bake for 2 minutes. Cool the pastry case completely. To make the frangipane, beat the butter and sugar together in a stand mixer for three minutes until creamy. Add the almonds then beat in each egg one at a time. 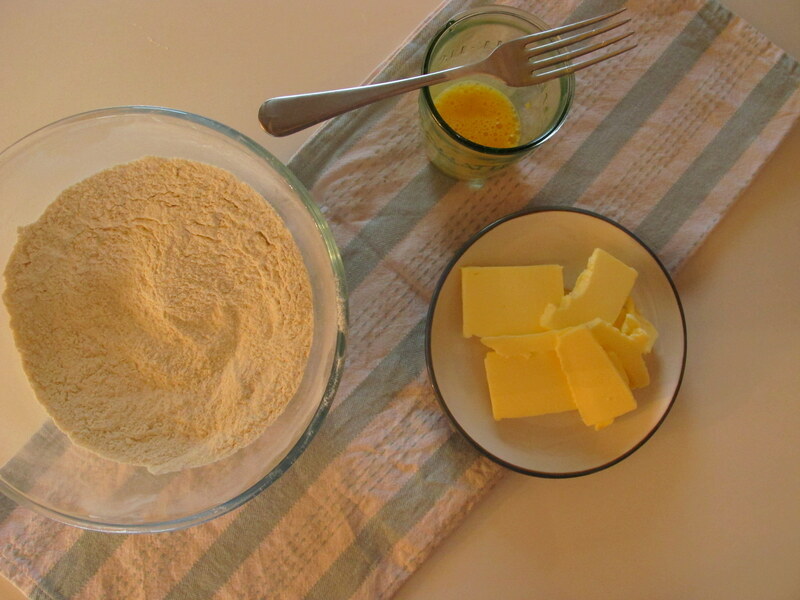 Add the flour and lemon zest then spoon half the mix into the cooled pastry case, refrigerating or freezing the remaining half. 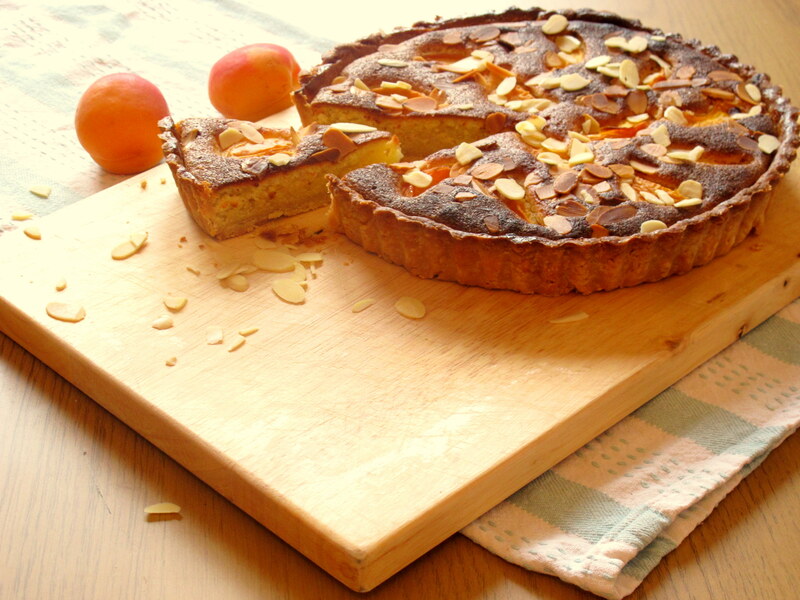 Arrange the apricot slices in two circles on top and scatter over the flaked almonds. Bake in the oven at the same temperature for 25-30 minutes. Mine caught slightly in the oven so take care to keep an eye on the frangipane as it can brown quickly. Remove from the oven and cool on a wire rack for 10 minutes before removing from the tin and cooling completely. Finish with a scattering of flaked almonds and whipped cream or ice cream. 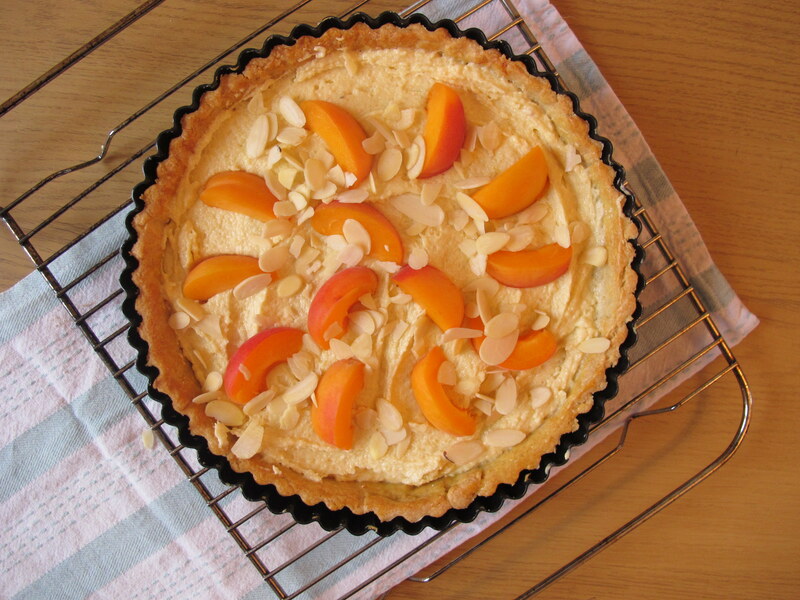 Love apricots, love frangipane tarts, delicious! And you write beautifully. I have all sorts of problems with taking good photos and before I can even attempt any more complicated things, I need to sort out the issues with light: I either have too much or too little. I need to sign up to some photography blogs! Yours are great, by the way. Reblogged this on Arizona Blue Ribbon Pie Round-Up & BakeOff. Ah, stop it already Pease! Your blog is a real threat to my waistline… my only consolation is that I don’t have an oven down here so I fortunately (unfortunately really) can’t take advantage of all your indelibly tempting recipes which are so terrifically written and detailed that I feel fatter (albeit happier) just after reading one of them! Shame on you! Yummy yummy yummy! I’ve made mini peach frangipane tarts before but a big one would be so much more satisfying.This looks gorgeous!